The Bowie Glock is born from a high level of practical knowledge and functional understanding of what is needed in a combat pistol. I like the Glock, and, like many people, I shoot it well. I also admit that I like pistols that are pleasing to the eye. Clint Smith put it quite succinctly while I was checking out the highly engraved 1911 that he carries as a personal-defense and teaching gun. He noticed the amused look on my face and, with that large grin that he is famous for, said, "Hey, if you're going to have one, it might as well be a nice one." Well said. My personal carry gun is a Glock 19. Yes, I know, it's a subcaliber, half-powered cartridge that no true man would carry. Well, I beg to differ; I have seen a number of people over the years who have quickly ended up on the coroner's slab due to the 9mm. I shoot it well, and I like the long life that Glock 9mm pistols offer, so I load up with quality ammo and don't worry too much about it. Accurate shooting will quickly end any fight, and the Glock 19 will do this. The 19 is small enough to carry concealed but large enough to feel like a fistful of gun if hostilities arise. With a full 15 rounds (though 10 will get the job done if you are strapped with "Clinton mags"), the Glock 19 has enough ammo to get through even the most prolonged fight if the shooter does not throw away ammo spraying bullets. While the Glock's black, square appearance may appeal to some, most just tolerate it. I decided that I would not. While the Glock is extremely functional, it is not perfect. Few guns are, and there is none that fits everyone. This brings me to Dave Bowie, full-time cop, part-time instructor and master of the Glock beautification process. I met Bowie during a course at the Tactical Defense Institute (937/544-7228; www.tdiohio.com) in southern Ohio. At the time, Bowie was an adjunct instructor at TDI and a full-time photographer for a big city newspaper. Bowie's time at TDI resulted in his being hired as a prosecutor's investigator and crime-scene photographer. After a few years Bowie took a job with the county sheriff's office and currently works as a patrol deputy and SWAT-team member. Bowie is also a skilled competitor and remains an adjunct instructor at TDI. Over the years, Bowie saw many guns go through the school that had been customized by big-name gunsmiths. Sadly, a number of these guns failed during the training, and this started him thinking. After years of fiddling with guns that came through the school, Bowie started to perform well-thought-out custom modifications on students' guns. These modifications were not only functional but also quite attractive. The word of his work spread to the point that he has a solid part-time business. One of the jobs is a beautification of the Glock pistol that is based solidly in defensive functionality. The first thing Bowie does is remove the factory checkering and stipple the entire grip surface by hand. This modification, while pleasing to the eye, also adds a solid grip surface without being too sharp. Bowie does it one indentation at a time, so it takes him quite awhile to finish a grip surface. He also rounds and stipples the triggerguard area. This makes the frame look a bit more streamlined and removes a snag point. Also stippled is the tip of the magazine-release button and the slide-cover plate at the rear of the slide, giving the polymer areas a consistent appearance. The triggerguard is rounded and hand stippled to remove a potential snag spot. While the Glock's magazine well is pretty nice, Bowie cleans it up so that it is almost competition grade. Speed loading is a fine motor skill that is hard enough to accomplish without the stress of an armed conflict. Bowie makes the hole on the bottom of the grip as wide and smooth as the grip material will permit. Additionally, he strongly recommends a plug to fill the open area at the rear of the Glock grip to aid in a more precise reload. To remove any sharp points that can print through a concealing garment or snag during reholstering, Bowie radiuses both the front and rear of the Glock slide. This is not an easy process; breaking through Glock's super-hard Tenifer finish is not as simple as it sounds. He also carefully ensures that the edges stay symmetrical. To me, this small modification helps the G19 look a lot less ugly by creating a more rounded and streamlined slide that glides much more easily into the holster. While Bowie does a lot of work by hand, he works closely with Doug Vetter of Blue Creek Tool for more advanced modifications. Vetter owns a CNC manufacturing company and is a highly skilled gunsmith in his own right, performing everything from simple 1911 action jobs to building custom .50-caliber rifles. I like forward cocking serrations on my pistols, a modification that I realize is controversial in some circles. I was taught many years ago how to perform a proper press check--one that does not require the support hand going forward of the muzzle. At the same time, I realize that my hand is near the muzzle, so I want the additional bearing surface that cocking serrations add. I like to know that my carry gun is loaded, and I like to do this visually. I will continue to press check, and I will continue to add the positive gripping surface that serrations provide, so I had these added to my Glock. s, forward cocking serrations were added at the author's request. Once the slide modifications are completed, it must be refinished. Bowie uses KG Gun Kote in either black or matte-stainless-like finish. I like two-tone guns, so I would probably opt for the stainless look. However, in my humble opinion, I feel the best gun finish currently available is NP-3 as provided by the Robar Companies. If you have ever cleaned a gun with NP-3 applied, then you will understand. Not only is NP-3 good-looking and tough, it also allows hundreds of rounds of crud to be literally wiped away. I opted to have Robar NP-3 applied to the Bowie slide. Another controversial topic is the use of the slide-stop lever as a slide release. 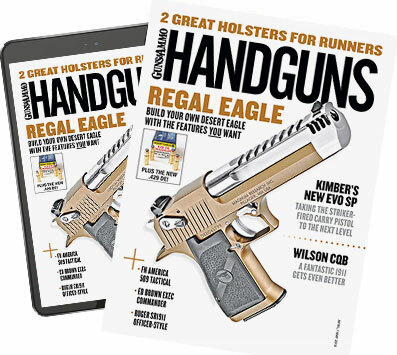 This is only controversial because a number of instructors have decided that releasing the locked slide with the shooting hand or support-hand thumb constitutes the use of fine motor skills, which deteriorate during a high-stress event. While I admit this is true, these same instructors seem to have no problem using the tip of the thumb to release the magazine, the tip of the finger to press the trigger or the tips of the fingers to guide the magazine into the magazine well. Nope, I don't buy it, so I continue to use the slide-stop lever as a slide release. I find it quite easy to place the thumb against the slide and push it downward, hitting the lever along the way. As a matter of fact, I find this to be an easier motor skill than trying to find the magazine-release button. Regardless, the Glock slide release is too small to permit easy use in the described manner. Additionally, its location is right under the thumb of the shooting hand, so I built my own. I took a Glock slide release, heated it and bent it outward. Then I spot-welded a piece of metal near the front, closer to the muzzle. This places the lever in a location similar to that of a 1911 or HK pistol. I can now drop the slide after I insert a magazine into the slide-locked gun. This cuts as much as two to three seconds off reloading time--a lifetime in a gunfight. The final addition Bowie added was a set of XS 24/7 tritium big-dot combat sights. These express-style sights are hard to ignore once the gun is brought up. The large white dot with the lime-green center is placed in the narrow V-notch rear that has a vertical line, giving the final sight picture a lollipop look. The XS sight picture is easy to acquire and has been proven in countless actual shooting events. The rear of the slide shows a number of custom features including a rounded slide, a hand-stippled slide cover and an XS rear sight. The XS big-dot tritium front sight is hard to miss. At the range, the two-tone compact digested 600 rounds of various 9mm ammo without a hitch. I feel Federal's Expanding Full Metal Jacket (EFMJ) ammo is the best defensive load available, and I tested combat accuracy by shooting five-round groups at 3x5-inch cards as fast as I could. PACT timer splits varied from .22 to .28 second. At distances from seven to 15 yards, all rounds were easily kept on the cards. Since Bowie did nothing to the internals of the gun (I installed a factory Glock smooth-face trigger), this accuracy can be directly attributed to the reset distance of the short trigger and the hexagonal hammer-forged barrel. This provides a better gas seal while reducing the drag created by traditional rifling. Hammer forging is an expensive process, but it's worthwhile because it provides the high level of accuracy found in all Glock pistols. I also did a number of Bianchi plate runs at eight yards in the 2.5-second region, proving that the removal of the slide material did not increase felt recoil. The gun is also fast out of the holster, mostly due to its short slide length and low bore axis. The Glock 19 is one of those guns that just seems to point itself to the target. From a FIN Designs kydex speed scabbard I was able to down the eight-inch plates at seven yards in the .98- to 1.04-second region. FIN Designs holsters are top-notch rigs that are offered in a number of innovative designs. The Glock is not the only gun on which Bowie works. He has also become quite a Springfield XD specialist, modifying XD frames and slides to enhance performance. If you like the Glock the way it is, great. It's a terrific gun. But if you want something a little more streamlined and proportional, something a bit more personally appealing and still quite combat functional and reliable, check out Dave Bowie. I think you'll be glad you did.